Well, there’s a bit of carpet still to be laid, but otherwise the house at the corner of Davenport’s 8th and Gaines streets, which was atop the city’s demolition list three years ago, is now restored — rebuilt, actually — and ready to be moved into. The completion is a huge accomplishment for a group of volunteers in the historic Gold Coast neighborhood who tackled the job with what were — in hindsight — naive hopes that it could be finished within a year. Their hope was tested, but they kept at it, logging hour after sometimes-grueling hour. They totaled more than 2,800 hours — the equivalent of 350 eight-hour days — doing everything from the initial clearing out of debris to the tedious stripping and finishing of woodwork. The past four weeks have been a 12-hours-a-day, seven-days-a-week marathon to meet funding deadlines. The effort was spearheaded by Jack Haberman, a retired IBM development engineer who moved to the Gold Coast 11 years ago with his wife, Marion Meginnis, who retired in May 2007 as president and general manager of WQAD-TV. Haberman helped form a nonprofit organization called the Gateway Redevelopment Group with the mission of saving abandoned homes in the neighborhood. They picked the name Gateway because heavily traveled Gaines street, linking to the Centennial Bridge, is both a gateway to the city and to the Gold Coast neighborhood. Since their work began, other positive projects have gotten under way on the street. 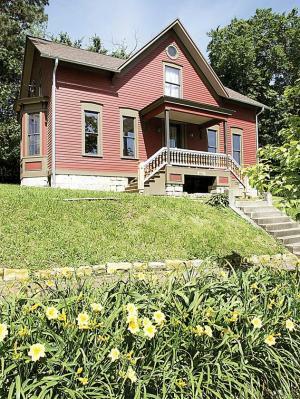 Money for the house at 822 Gaines — which cost in excess of $130,000 — came (or will come) from five main sources: $30,000 from the City of Davenport’s HAPPEN program that makes money available for rehabilitating abandoned or vacant housing, $25,000 in State of Iowa historic tax credits, $40,000 in interest-free loans from individual members of the Gateway group, $30,000 from a Quad-Cities Housing Council loan and $5,000 in an interest-free loan from Carol Schaefer of Davenport. In addition to the volunteer labor, the project could not have been accomplished without skilled contractors who agreed to do work such as plumbing, heating, air-conditioning, electrical and insulation, and wait until the house is sold to receive payment. “They’ve been carrying us for two years,” Haberman says. In addition, Mark Construction did the roofing and framing for about half the going rate. The home is being purchased for $86,000 by Evelyn Garrison of Davenport. She and her three children previously lived in Des Moines, but they moved to Davenport when they learned of the house through a friend who lives in the neighborhood and then decided to buy it. Garrison is employed as a family team meeting facilitator for the Scott County Empowerment Board. The Gateway group knew from the beginning that the home would sell for less than it cost to restore, but that wasn’t the point: They did it for the good of the neighborhood. “We don’t need another vacant lot, we need a family,” Haberman, the president of the group, says. While Haberman and Meginnis steadfastly deflect praise for their efforts, saying, “It’s the volunteers” who have made all the improvements possible, the volunteers say otherwise. Three years ago, 822 Gaines St., Davenport, was a boarded-up wreck with a gaping hole in the roof. Today, it is a showplace painted in a red, chocolate and black color scheme with a solid new roof and lace curtains at the windows. A simpler porch more in keeping with the home’s circa-1876 appearance has replaced the dilapidated, two-story addition and roof dormers that were in place when restoration work began. The porch railing is made with spindles from the central staircase in the former Petersen’s department store, now the River Music Experience. “We’re really proud of that,” said Jack Haberman, a founder of the Gateway Redevelopment Group that rebuilt the home. The spindles are among many pieces of architectural salvage used in the home. The house had already been gutted by a previous rehabber, and only the front parlor still had a plaster wall and original woodwork. Because the home was so bare, finding salvage from other old homes provided utility as well as character. The 8-foot by 8-inch front door — donated from a home at 5th and Western in Davenport — opens to a foyer and staircase. You might think the staircase is original, but it isn’t. The railing and posts were salvaged from an 1880s apartment house in Muscatine, Iowa, by neighborhood volunteers Dennis LaRoque and Troy Smith, and the treads came from a home torn down to make way for a Walgreens under construction at Brady and Locust streets. To the right of the foyer is the first of four sets of pocket doors salvaged from homes along Harrison Street that were demolished in a St. Ambrose University expansion project. Beyond those doors is a dining room with a bamboo floor, and beyond that is the kitchen. Between the two rooms is an 8-foot doorway with a leaded-glass window. Haberman knows it’s eight feet wide because he built it exactly to accommodate the glass, salvaged from one of the Harrison Street homes. The kitchen features birch cabinets dressed up with crown molding, another leaded-glass window and a granite tile floor. Granite tile isn’t too expensive for the material itself — about $2 per tile — but the installation is labor-intensive, he explains. Volunteer help from LaRoque, the owner of the Beiderbecke Inn, made it possible. The kitchen also contains a door to the back yard and a laundry closet. Completing the first floor is a half-bath and two parlors, one with a three-window bay. Some of the trim in the front parlor is original, but it has all been stripped and finished with new faux graining. Upstairs is a master bedroom suite, plus two secondary bedrooms and a common bath. As for the 2,100-square-foot structure itself, most of the outside frame and all of the foundation are original, but that’s about it. Everything else is new: roof, floor joists, sills, main beams, and the plumbing, heating and electrical systems.